This magnificent Italian glass magnum bottle stands over half a metre tall and contains the equivalent of three normal bottles of Sebor Absinthe. Each beautiful bottle comes individually numbered and sealed with real cork. 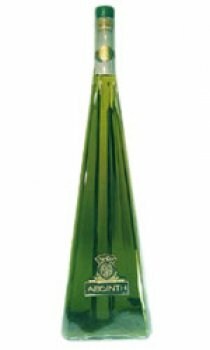 Produced in Czech Bohemian mountains by traditional brewing methods, this authentic handmade Absinth has the maximum permitted "wormwood" (artemesium absinthium) and absolutely NO artificial colours or flavours.